The conspicuous phenomenon of small fractions of cortex tissue of fossil Aglaophyton and Ventarura being distinctly seen in Rhynie chert while all the rest has vanished has been ascribed to an enigmatic decay resistance in Part (1). This interpretation contradicts another one proposed earlier [1,2], according to which dissolved silica penetrated into a limited depth below the epidermis of Aglaophyton, preserving a layer of peripheral tissue there while the tissue farther below was left to decay. Close inspection of samples as in Fig.1 provides additional arguments against an interpretation according to which the thickness of the preserved tissue equals the penetration depth of quick silicification, thereby confirming related doubts raised by A. Channing . 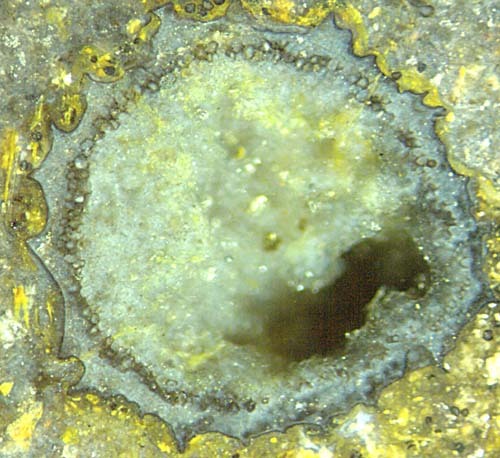 Fig.1: Aglaophyton as a "hollow straw" in Rhynie chert: ring of well preserved cortex cells between the poorly preserved epidermis and decayed cortex and phloem. One related argument follows from the fact that the outermost layer of cells, the epidermis, is often poorly preserved while a few layers below are surprisingly well seen. The epidermis is essentially reduced to a pale structureless ring in Fig.1, except for a patch on the right, where cell walls are vaguely visible. So it becomes obvious that the phenomenon of strongly differential preservation is more complex than thought at first sight: While most often Aglaophyton is silicified rather evenly throughout (see Rhynie Chert News 60, Fig.1), less often it appears as a hollow straw with poorly preserved or missing epidermis. This is illustrated here with a few more pictures taken from other samples. Figs.2,3: Aglaophyton hollow straw 4mm: well preserved narrow layer of cortex cells and poorly preserved epidermis as often seen in Rhynie chert. Width 1.7mm. thus easily confused with Ventarura. The existence of very narrow and even discontinuous dark rings makes the stark contrast of small parts of cortex tissue or cells or separate cell walls even more enigmatic. The subject does not become less enigmatic when the persistent cortex rings of Ventarura are included into the considerations. 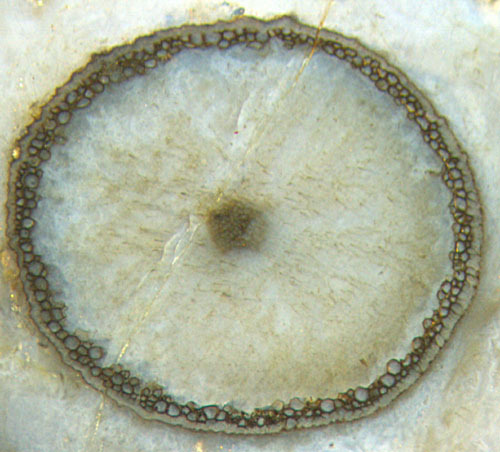 They do not seem to differ much from the rings in Aglaophyton, except for the fact that usually they are not close to the epidermis. Fig.5: Ventarura cross-section with persistent cortex ring thinning out towards below right. The surface of Ventarura is most often shrivelled as a result of shrinkage after decay of the cortex fraction between the persistent cortex ring and the epidermis. (The epidermis of Ventarura has been found only once, see Rhynie Chert News 61 ). The ring can be 5 or more cells thick, and with dark and apparently thick cell walls it appears strong, hence it has been called sclerenchyma  but most probably does not deserve such distinction as it is mere cortex tissue which did not decay for reasons unknown. - persistent rings without a dark stain on the cell walls. Which kind of process control, probably in the live plant, could possibly distribute the decay resistance among the cells in such a way that a persistent circle is formed which can even be discontinuous ? A corresponding question arises in connection with the rings of fungus-affected cells in Aglaophyton and Rhynia. (See Rhynie Chert News 32). This may or may not be helpful in the attempt to find an answer. - the similarity of the persistent cortex rings in Aglaophyton and Ventarura hint at the involvement of a common cause. The persistent cortex rings seen on cross-sections of Aglaophyton and Ventarura offer problems which hopefully may lead to revealing solutions.